Last Friday night, the Boston Bruins were playing the Columbus Blue Jackets at Nationwide Arena in Columbus, OH. With about four seconds left in overtime, Blue Jackets defenseman Dalton Prout and Boston Bruins forward Milan Lucic were engaged in a physical altercation. Both players looked like they were ready to engage in a game ending fight. If you watch the video, you can see that Lucic had grabbed Prout. The Blue Jackets defenseman saw that as an invitation and dropped the Bruins rugged forward with a sledge-hammer. Apparently, Lucic didn’t think he was going to get hit. After Saturday’s game against the Montreal Canadians, Lucic was asked by a member of the Boston media about the Prout punch. Stick tap Tim Rosenthal, Bruins Daily. 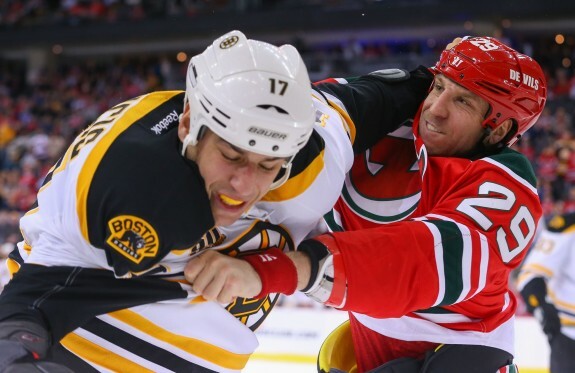 “It was the end of the game and I let him know that I wasn’t going to fight him,” Lucic recalled. “I wasn’t prepared and I let my guard down and that’s what happens when you let your guard down. I’ve been in over 100 fights and I never took a shot like that. These comments make Lucic appear petty and whinny. In this situation, Lucic should have just let this one go. No comment by Lucic would have worked here. Or he could have said, “Hey – Prout got me, that’s hockey.” Instead of taking the high road, Lucic comes off as being a whiner. In this case, no one is going to feel sorry for him. Let’s be honest, Lucic is not exactly a choir boy, he’s got a history of doing questionable deeds on the ice. It’s not like Lucic holds the moral high ground here. If you don’t believe me, log on to Youtube.com and search the name Milan Lucic. There’s plenty of material to work with. You will find a few videos of Lucic’s wayward stick. I would also imagine that Danny Dekeyser and Alexei Emelin aren’t going to feel any empathy for Lucic. I know it’s cliché, but live by the sword, die by the sword. This is what Prout had to say about the incident. Apparently, Lucic is looking forward to the next meeting between the two teams. It will be interesting to see how this plays out, the Bruins and the Blue Jackets play two more times this season and it’s obvious that Lucic doesn’t like being shown up.